- They avoid hitting each other for fear of damaging their car in such a manner that will potentially take them out of the derby. - Demolition derbies are won by being the last car moving. 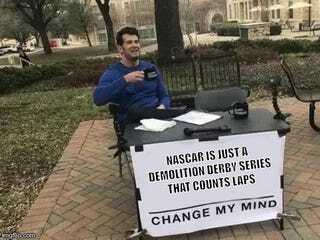 NASCAR just reduces the amount of time this takes by letting the drivers also compete on laps. Pro drivers are particularly skilled in avoiding other cars hitting them. - NASCAR places specific requirements on car construction: No glass windows, limitations on engines, fuel cells so fires are rare, constructed with specific size parameters, safe for derby participants, and easily disabled in an accident. - People watch it for the crashes but are excited when someone survives to go the minimum number of laps.